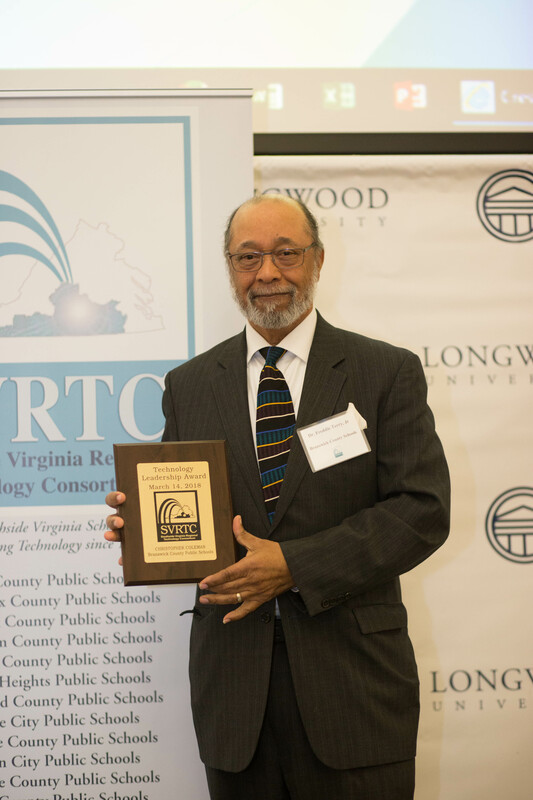 Dr. Freddy Terry accepts the Technology Leadership award on behalf of Christopher Coleman who was unable to attend. Dr. Terry has been a dedicated supporter throughout the years and continues to take photographs for the SVRTC banquets. The Southside Virginia Regional Technology Consortium (SVRTC) celebrated the 12th annual SVRTC Technology awards banquet on Wednesday, March 14, 2018 at Longwood University. Twenty-three SVRTC school divisions were represented with 144 registrations, including thirteen division superintendents. The program began with a welcome from Dr. Larissa Smith Fergeson, Interim Provost and VP of Academic Affairs. Stephanie Playton, STEM Learning Specialist of the Institute for Teaching through Technology and Innovative Practices (ITTIP), followed up with a presentation “In Celebration Of SVRTC – 2017-2018” to bring attention to the technology integrations that have been facilitated through partnership with SVRTC. Additional celebrations were presented through sixty awards to SVRTC members and one school division. There were two competitive awards. The Technology Leadership award was presented to Christopher Coleman, Brunswick County School Division High School Principal, and the Division Leadership award was presented to Lunenburg County School Division. A complete awards list of the 2018 recipients can be found on our Annual Awards Banquet page , as well as a slideshow presentation of awardees. You can also learn more about the awards and there descriptions by viewing the application information. Pictures from the event can be found in the SVRTC picture gallery.